As October is drawing to a close, typical Halloween Promo products start to fill the stores. The season of pumpkin spice lattes and candy corn gets people in the mood to decorate their houses with spooky themed items. This pumpkin lamp might make a wonderful addition to this years All Hallows’ Eve! 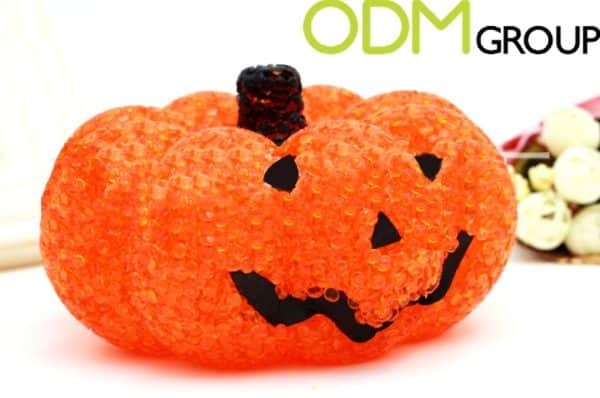 This pumpkin lamp is made out of little “crystals” of plastic, and has a light within. The front has black accents in the shape of a Jack-o’-lantern face. This will give a nice little detail when the light is switched on. This lamp would make a great Gift with Purchase. Especially having a promotion close to a Holiday will make you reach customers who would normally not be interested in these kinds of products. Why do we like this pumpkin lamp for Halloween Promo? Attracts Customers: During the Holidays, people are always looking for new and fun ways to decorate their homes. When they see such a novelty item being offered for a Halloween Promo, they will be attracted and want to take part in this promotion. Brand Remembrance: A unique Halloween Promo product like this will create a memorable moment for your customers. And because Halloween is an annual festival, you can be confident in the fact that your customers will want to come come back to you for more fun and quirky promotions. Design appeal: These products can be custom made to suit whatever marketing campaign your brand is looking to do, whether it be to promote a new product or for a sporting event or movie release.